in the direction bd (Fig. 104); the raindrop will still fall exactly vertically, but if the gun advances laterally while the raindrop is within the barrel, it strikes against the side. In order to make the raindrop move centrally along the axis of the barrel, it is evidently necessary to incline the gun at an angle such as bad. 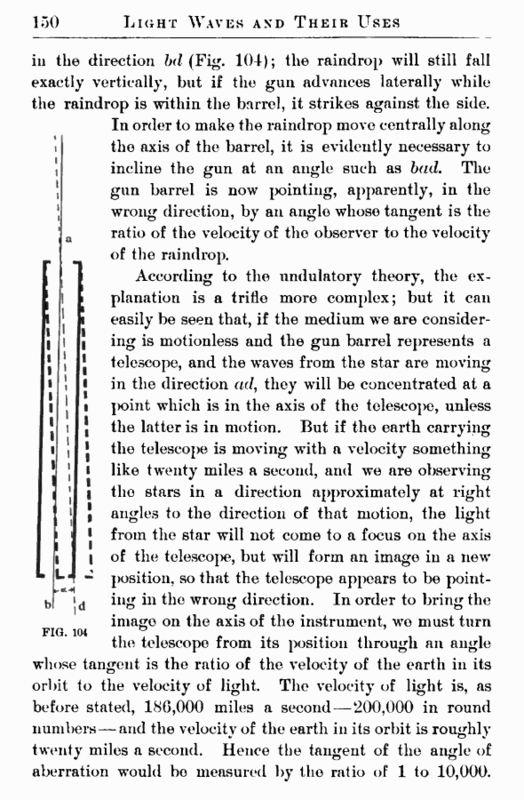 The gun barrel is now jointing, apparently, in the wrong direction, by an angle whose tangent is the ratio of the velocity of the observer to the velocity of the raindrop. the telescope from its position through an angle whose tangent is the ratio of the velocity of the earth in its orbit to the velocity of light. The velocity of light is, as before stated, 180,000 miles a second—200,000 in round numbers — and the velocity of the earth in its orbit is roughly twenty miles a second. Hence the tangent of the angle of aberration would bo measured by the ratio of 1 to 10,000. More accurately, this angle is 20 ?445. The limit of accuracy of the telescope, as was pointed out in several of the preceding lectures, is about one-tenth of a second; but, by repeating these measurements under a great many variations in the conditions of the problem, this limit may be passed, and it is practically certain that this number is correct to the second decimal place. When this variation in the apparent position of the stars was discovered, it was accounted for correctly by the assumption that light travels with a finite velocity, and that, by measuring the angle of aberration, and knowing the speed of the earth in its orbit, the velocity of light could be found. This velocity has since been determined much more accurately by experimental means, so that now we use the velocity of light to deduce the velocity of the earth and the radius of its orbit. 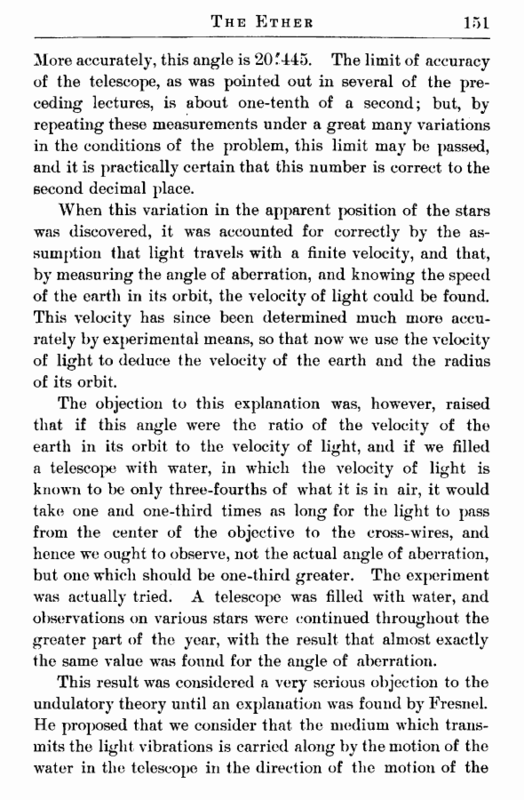 The objection to this explanation was, however, raised that if this angle were the ratio of the velocity of the earth in its orbit to the velocity of light, and if we filled a telescope with water, in which the velocity of light is known to be only three-fourths of what it is in air, it would take one and one-third times as long for the light to pass from the center of the objective to the cross-wires, and hence we ought to observe, not the actual angle of aberration, but one which should be one-third greater. The experiment was actually tried. A telescope was filled with water, and observations on various stars were continued throughout the greater part of the year, with the result that almost exactly the same value was found for the angle of aberration.